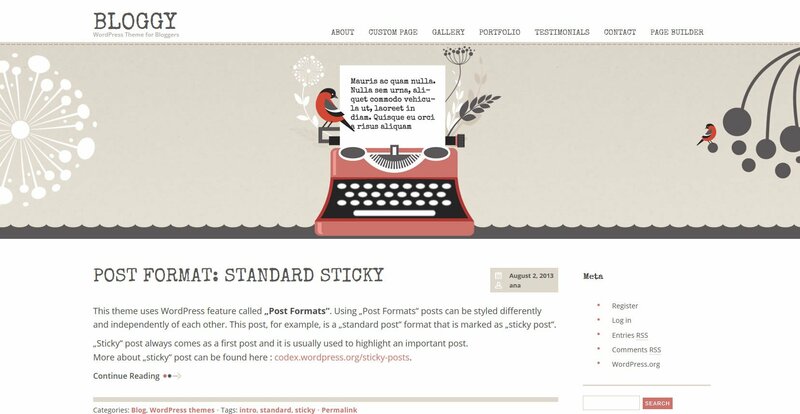 Bloggy is a simple WordPress theme is built for bloggers that prefers a personal and effective theme. Bloggy is designed to be personal and sincere, just as though you are reading letters from your pen pal. The content area is maximized to 2/3 of the reading area as the focal point of the theme is on your blog posts. The side bar takes up the remaining 1/3 of the text area for your widgets and menus. Should you prefer not to have the sidebar , you can set the page to full page. You can customize the site colors via the WordPress customizer to personlize your blog. Bloggy supports most post formats like Sticky post, image post, quote, gallery, link, video and audio posts. The theme is also WooCommerce compatible and style integrated should you need to sell your products online. It also comes bundled with the premium Soliloquy Slider and its premium addons which retails for $19-$99. Bloggy retails from $59 – $199 as part of a bundle that gives you access to all themes from Anariel Design. Anariel Design currently has 21 well made niche themes in its collection.